Some of you may remember Jet Force Gemini, a Nintendo 64 classic from the golden days of Rare. 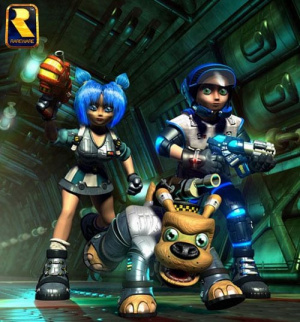 Though Banjo-Kazooie and Goldeneye 007 may be games that are mentioned more, Jet Force Gemini was nonetheless a lovely third person shooter that positively oozed of Rare's charm and quality. It was also a one-off game, though evidently there was another game in development for the Game Boy Color at one point in time. What do you think? Would you have picked up this game? What did you think of the original Jet Force Gemini? Share your thoughts in the comments below. Just bought the game two weeks ago for the lovely n64, haven't had the time to play it through yet but I might start today! Oh how I wish this game had gotten a sequel. So much fun, and difficult. I remember having the original, such a cool game!! Great game, put a 100 hours into it. Man Jet Force Gemini. Needs a sequel. Badly. Regarding JFG as one of the 3 greatest N64 games ever, I had certainly been interested in playing anything more from the series. It would be interesting to see a bit of actual gameplay. One of those games I've always been meaning to get around to playing. If it was on the VC i'd get it in a heartbeat. I might have to look for a second hand copy. This is one of my favourites on the N64. It had great animation, graphics and soundtrack. I wonder if it's worth buying an Xbox 1 just for the Rare games compilation. Loved this game and still own it. Might get back on it because i never found all those villager things. I'm not too sure if this getting cancelled is that much of a shame. Around the time a lot of Rare titles were getting GBC versions - such as Perfect Dark and Conker - and none of them were particularly good games. I would love to return to the JFG universe, but that's never going to happen. Jet Force Gemini was an amazing game, especially the soundtrack, unbelievable! Although the game was hard. Very, very hard. I never could get used to the controls. The game was a great title for the N64...graphics may look outdated now, but when the N64 was out, this was great! It really does need a sequel, but unfortunately, the sequel would come to only Xbox. Does anyone know if this one is on the Rare Collection game for XONE? @cloudrunner64 King Jeff and the Tribals! Was gonna throw out an old 14" CRT recently and hooked up Jet Force Gemini for a laugh. Ended up playing through again and now can't bring myself to throw away the CRT. Gonna have to revisit a few more old N64 classics! @JLPick Yes, it is! This one and the other N64 games included are slightly improved: better frame rate, crisper visuals, etc. Also, you can map the buttons for Jet Force Gemini. It's worth having an XOne for Rare Replay alone. Conker's Bad Fur Day (N64) is also included and it's extremely expensive if you search the original version on eBay. This is one of those games that I REALLY want to get a sequel but due to the limited appeal that will almost certainly never happen. Still judging by the video that game looks pretty solid so I probably would have considered getting it if it would have been released. I played through Jet Force Gemini on Xbox One recently and the game still holds up marvelously in my opinion. Cool, never knew this! Would be a very different game though, since its a other developer and it probably wouldn't be 3D either. @gb_nes_gamer Jet Force itself is pretty cheap. Got it a few years ago with a worned box for 6€. @Rei Thanks but I still have the cartridge. It's just N64s don't play too well on modern T.Vs. A digital version of the game would be ideal. Great game, though I wonder how it's held up over the years. I liked the graphics on this game, especially the little space ships. Oh how I miss Rare in their prime, JFG is so great I still play it today on my n64. @gb_nes_gamer one thing to consider is there are modern TVs that still have composite in next to hdmi. Since I don't need any kind of converter cable for my old systems they all look fine on my tv. Even NES games blown up on that big screen look great. So you might want to consider that the next time you're shopping for a TV. @Blastcorp64 oh it's still as fun as ever. The controls can be a tad awkward cause we're all so used to dual stick now and such but it's still ok. I still play it from time to time on my n64. Unless the Follin brothers were back in town at the moment. Robin Beanland, Evelyn Fisher, Grant Kirkhope and Dave Wise were incredible artists. I'm sure there were others, but those names stuck with me. Best co-op ever! except when your player 2 shoots the last tribal on the planet just as you're about to collect it. multiplayer kinda stunk. Anyone ever master those floyd mini-games and unlocked the final multiplayer characters? Anyone actually enjoy the multiplayer? I got Perfect Dark and Conker on GBC just because I loved the N64 games so much. I'd have picked up JFG for GBC without a doubt. Same here. GBC perfect dark was certainly not perfect, but was cool. Plus you could plug it into the N64 tower and get some usefull cheats in the PD N64 title. Would have gotten this without a doubt. Awesome intro music. Anyone know why the footage stops or where I could see more? agreed about the Co-Op. Totally cool idea. Mario Galaxy I feel borrowed from this idea. I 100%'ed Jet Force Gemini with the co-op help, and beat the floyd missions, the race and the actual final boss after saving every one of the bears. The extra characters are just ants and a bear and maybe another insect. Not really worth 100%ing tho because the deathmatch characters are just ok and the final boss is the cheapest thing since plastic. I played the multiplayer a bunch when it came out and liked it. 2 weeks ago I had a 4p match and after 20min, put in Conkers Bad Fur Day instead. Great underappreciated game. Didn't know about the GBC game. The game play is still pretty unique which is why I think the few fans who discovered it are always wishing there was a real sequel. The CG characters for promotional artwork are some of the ugliest off-puting creations I've seen. Fortunately, they aren't as frighteningly hideous in-game.